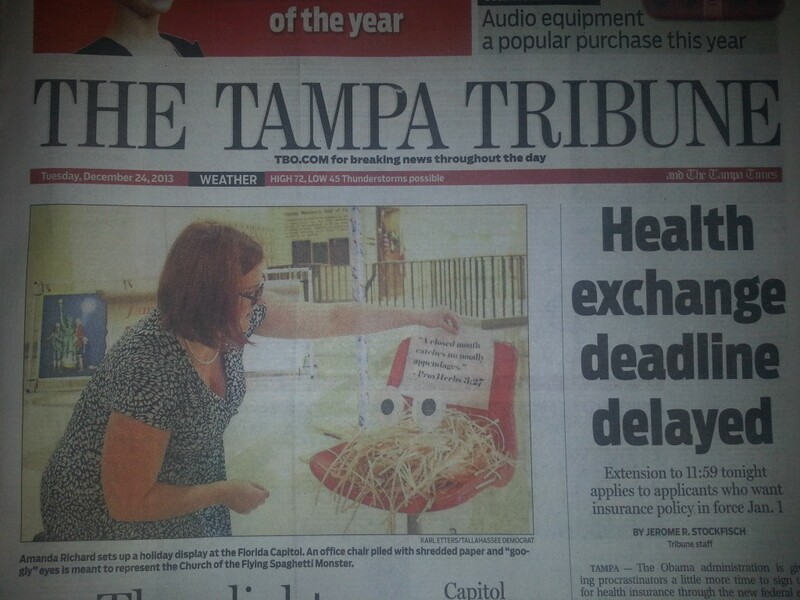 The Tampa Tribune featured the FSM Holiday display in today’s paper, front page. What do you think — next year, will the Florida Capitol allow any religious displays? Thanks to Jay Nelson for the photos. 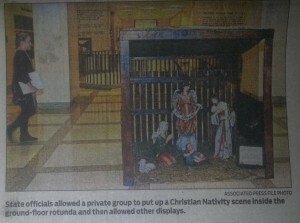 Why should X-tians get to put up a display for a pagan holiday? Get *your* own religious day you friggin moron. Pastafarians celebrate “Holiday” during the December period. Any overlap with the Christmas period is as coincidental as the relationship between Christmas and ancient winter solstice celebrations surely is. Christmas isn’t a Christian holiday. The Christmas tree, Santa Claus, Reindeer,Holly, mistletoe, Stockings, etc. even the date Dec. 25 were all comandeered from ancient Pagan religions so anyone has the right to celebrate. We are considering changing the name to Pastafariamas. Now tell us who is the moron? I thought that all of the main Christian holidays were hi-jacked from pagan festivals. But surely, all are times of decoration and celebration of mythology. So, I think that anyone should be allowed to present a mythical scene and suspect the competition would attract crowds of admirers. Personaly, I would look forward to seeing the Creationist one with a T-Rex in the stable. Aaaarghhhh..
Mr. Bean added a tyrannosaurus to a nativity scene. He also added a Coldstream Guard band, a removal van, dalek, Somua s35, something that is probably meant to be a Jagdpanther and a helicopter. Let’s see that outside a government building at Christmas. I—LOVE—MR—BEAN! And I love that episode!! Am Mrs Benita obaba from USA,i want to testify of the good work of DR FRANK. i was humiliated by my ex husband and also treated like a commoner because he got in contact with with a harlot who turned him against me totally. i need vengeance by all means so i got in contact with DR FRANK who help fight against the harlot and the two of them had a serious marital breakdown and confusion was now their breakfast and all and everything went down the drain and he is begging me now like seriously,as am saying this right now my husband is even more 100% in love with me again but i don’t want to give him any chance again because i don’t want to get hurt. so whatever your situation look like just email the below address now. Can Dr Frank explain how any of this works? Also, can he tell me how many pine nuts to put my pesto? It needs to be magical. Dear Ignoble, there is a lot of weird stuff in these blogs. It is good to get used to using twitter hack tools for account recovery as you never know when your own account could get hacked. Mine did! Functions: To clear heat and release toxins. To eliminate endogenous wind and stop convulsions to resolve phlegm and promote resuscitation.If you wish to try out what we have,then we will be so much pleased to get your inquiry.